Tigers are one of the most majestic creatures on earth. 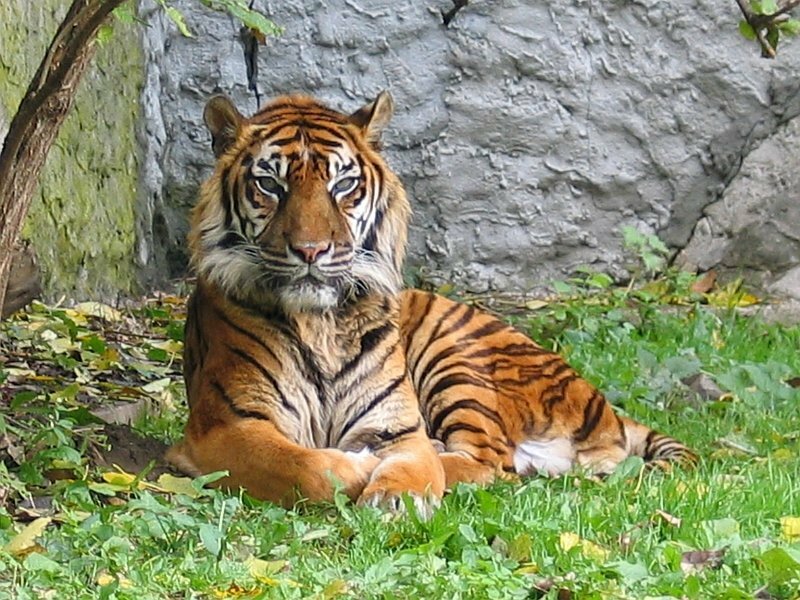 Even though tiger is the largest cat on earth, it is an endangered animal. Thousands of tigers have been killed by hunters and poachers in the last century. Most of the 3500 tigers alive today are found in Asian countries like India, Malaysia, Bangladesh, Thailand etc. 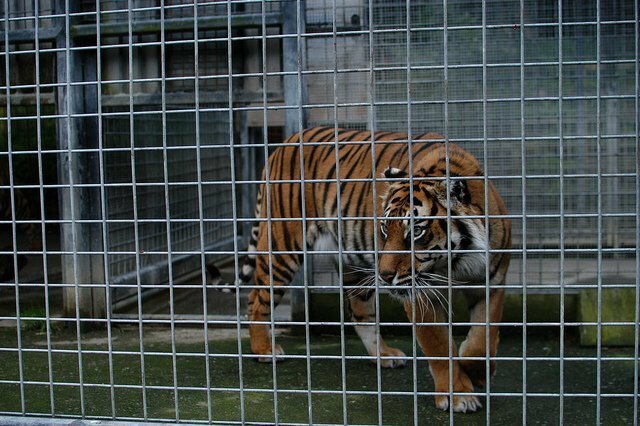 Many of these tigers are kept in captivity or chained in cages of a zoo. But there is a peculiar Buddhist temple in Thailand called the Tiger Temple, or Wat Pha Luang Ta Bua. This temple in Kanchanaburi, Thailand has become a popular tourist destination for its uniqueness. 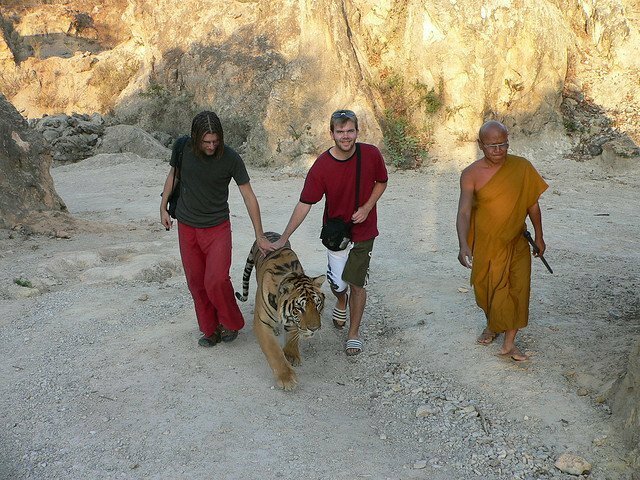 The tigers in this temple live peacefully with Buddhist monks. The Buddhist monks feed them, tend to them and protect them from external dangers. 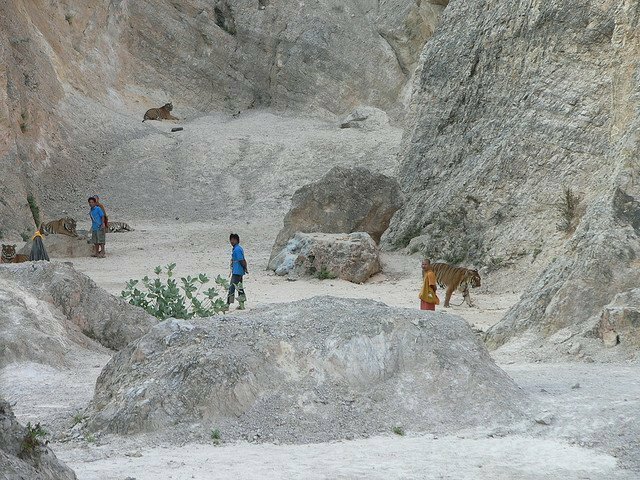 The monks believe that the tigers are reincarnations of ancient monks. Hence, they are convinced of the fact that these tigers won’t harm humans. 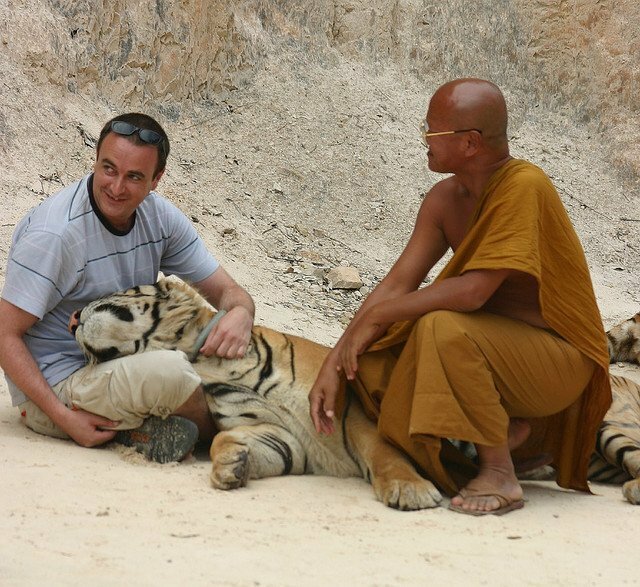 The monks encourage tourists to click intimate pictures with tigers. Here, we can see a woman caressing a tiger on her lap. The cute tigers seem to be accustomed to human interaction. Rather than acting like wild animals, they calmly allow humans to get rub their belly! 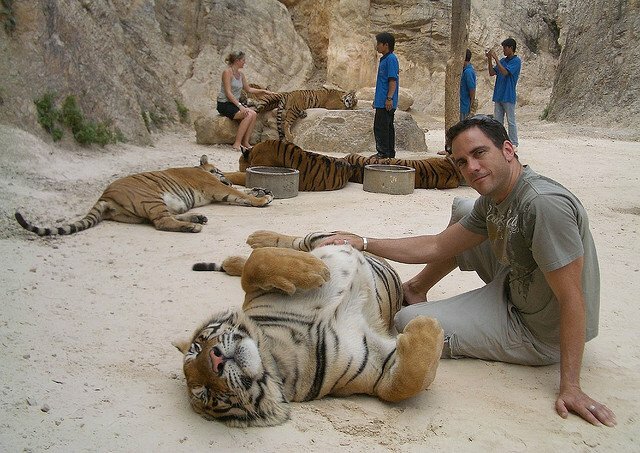 However, humans can interact with the tigers only for a couple of hours in a day. These tigers are allowed to rest, roam and play with each other for most part of the day. 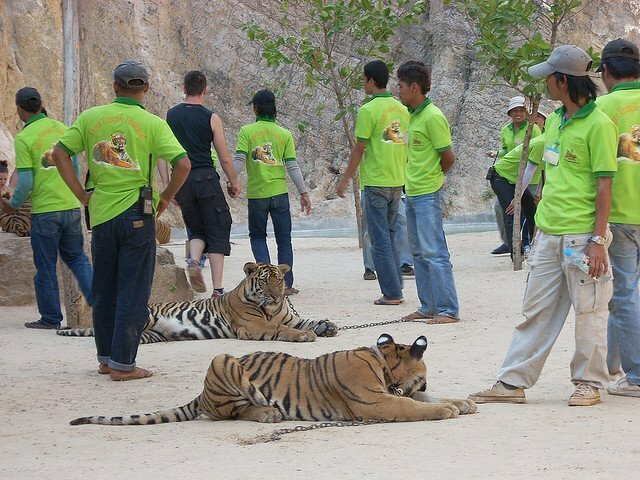 Many locals and foreigners volunteer to monitor the tigers and take care of the temple. Tigers are huge creatures with an enormous appetite! Hence, many people work together to ensure that these tigers are taken care of properly. Income from tourists is used for the up-keep of the tiger temple. 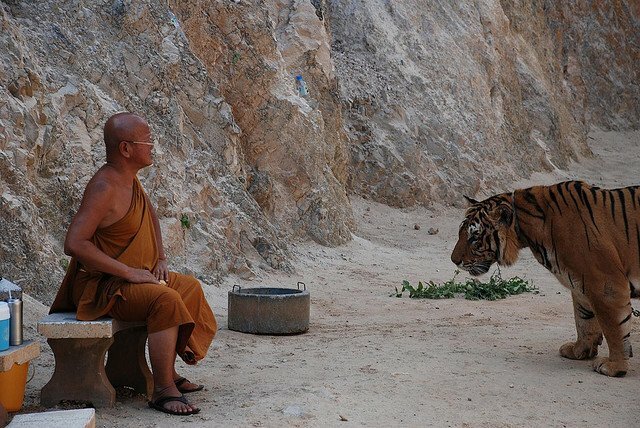 The monks and volunteers share a deep sense of compassion towards these tigers. 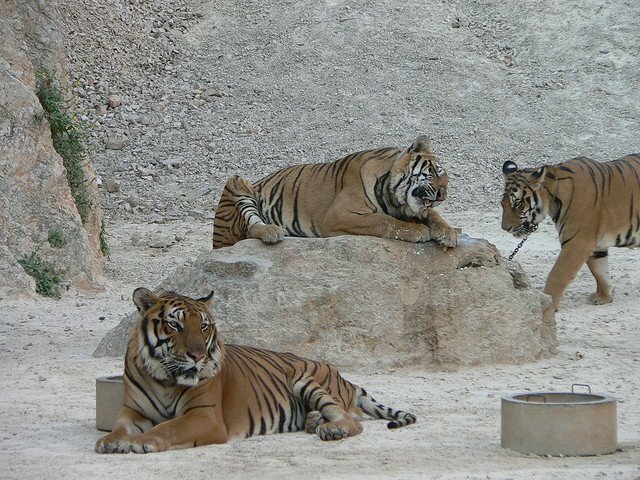 While these tigers may never be able to go back to the wild, this tiger temple ensures that these beautiful creatures never fall prey to hunters and poachers. This an an extraordinary reserve which defies all rules of the wild. But the Thai monks at the tiger temple assert that they have dedicated their whole life for the conservation and protection of tigers. Major efforts need to be taken for the conservation of this beautiful animal. The world needs takes steps to improve the population of tigers.